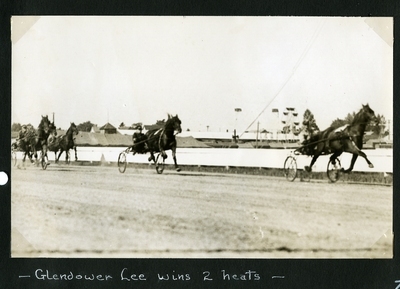 Black and white action photo of bay stallion, trotter Glendower Lee, H. Myott up, crossing the finish line in the heats of the 2.20 Class Trot on Thursday, September 30, 1937, at the Rochester Fair Races, Cold Spring Park, Rochester, N. H. Glendower Lee claimed all three heats of the contest but photographer, Guy Kendall did not identify which of the three heats was captured in this photo. The photograph also captures elements of the Rochester fair grounds in the background including the tops of various exhibition tents, the ferris wheel. The longest tent in the image likely housed the cattle exhibits.